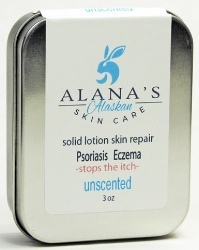 Alana’s Alaskan Solid Lotion Bar warms to the touch when applied to skin. It absorbs quickly and is not greasy. The bar can be kept open in a dish. We do recommend storing the bar in our tins or covered container if you have pets. (It will not harm them but does make for a very expensive treat!) Before bed I scrape some off with the back of my fingernail and rub balm into my cuticles and heels. Soft to the touch and pain free the next morning. 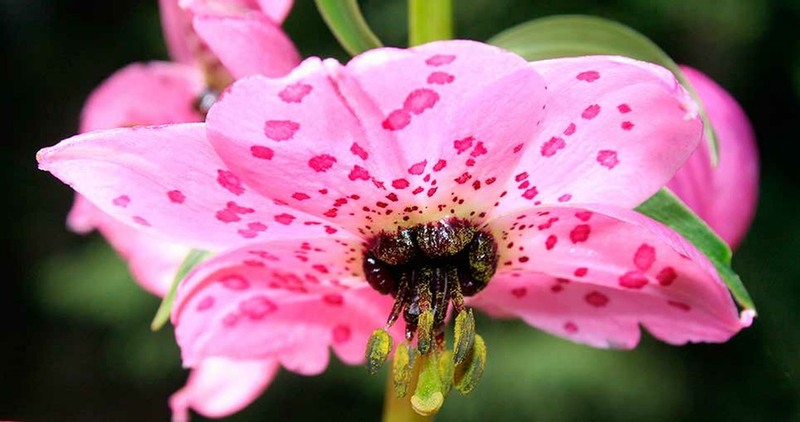 Our formula of only five pure ingredients is an all natural anti-bacterial, anti-fungal and antiseptic. 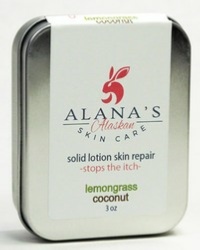 Alana’s Alaskan Solid Lotion Bars are poured, sealed and wrapped by hand. Can be refrigerated to reform or can be frozen. INGREDIENTS: Beeswax, Shea butter, Coconut oil, Avocado oil & Olive oil. Our beeswax is personally filtered thereby retaining the natural antiseptic healing properties and the sweet scent of honey. Tangerine Cranberry Lotion Bar Tin 3 oz. 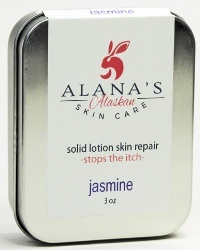 Jasmine Lotion Bar Tin 3 oz. Strawberry Lotion Bar Tin 3 oz. 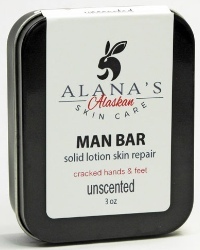 Man Bar Lotion Bar Tin 3 oz. Lemongrass Coconut Lotion Bar Tin 3 oz. 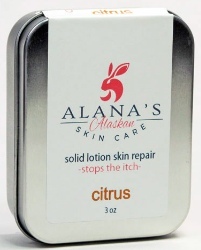 Citrus Lotion Bar Tin 3 oz. 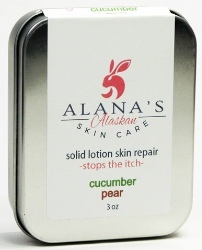 Cucumber Pear Lotion Bar Tin 3 oz. Unscented Lotion Bar Tin 3 oz.